2015年度に確認されたOS Xのマルウェア数は、過去5年間に発見されたマルウェア数の5倍以上に及ぶという調査結果が公開される。 | AAPL Ch. A 10-week analysis conducted by the Bit9 + Carbon Black Research Team validates the unprecedented growth in OS X malware. With an extensive global reach and a pulse on the expanding threat landscape, the Bit9 + Carbon Black team collected more than 1,400 unique OS X malware samples. 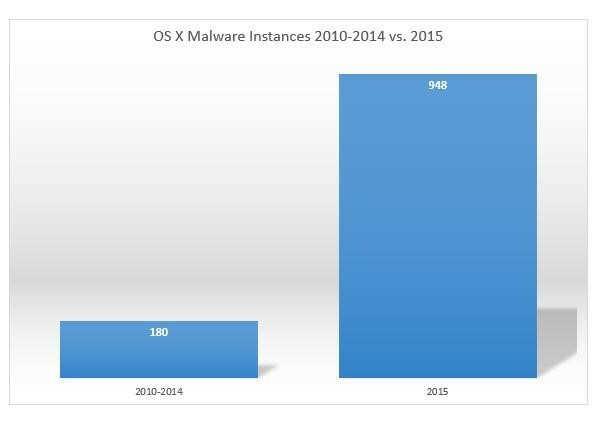 In 2015 alone, the research found, the number of OS X malware samples has been ve times greater than in 2010, 2011, 2012, 2013 and 2014 combined. During analysis, the team found that most OS X malware would utilize features of the OS such as LaunchDaemons/LaunchAgents, login items and browser plugins. Malware more often resided in user-land and leveraged persistence mechanisms that supported this as opposed to attempting to reside in kernel-land by writing custom kernel extensions. LaunchAgents — An OS X-provided way to start programs on a per-user or system-wide basis. Cron job — Cron is a time-based job scheduler in Unix-like computer operating systems. Cron jobs are used to run scripts/programs periodically at xed times, dates or intervals. Binary infection — When one executable modies another so when the original executable is run control is passed to the malicious code prior to the original code being executed. Consumers should ensure they have an antivirus software program installed and that it is running with the latest update. While many OS X antivirus products are only moderately effective, for consumers this will provide a base-level of protection. There are numerous free options available from companies such as Avast, MalwareBytes and Sophos. This is where Bit9 + Carbon Black’s findings need some clarification. By my definition of the term “malware,” I’d say that the appearance of new malware in 2015 has fallen still further from its peak in 2012. By my counts, six new malware families appeared in 2014, and that number has been lower each year since 2012.